While enjoying one of my readers blogs this morning, I discovered a women who suffers great fear sleeping in her home at night. In fact, she shared, her preference is to pull a night shift to avoid the horrific experience. How tragic anyone has to endure such a night without the comfort of another human being. It started me thinking of my own fears. What I know for sure: Language is powerful. As soon as I use the word 'fear' or 'afraid' in any context, thinking or speaking, it instantly instills a 'flight or fight' response in my body. It may be a mild one, however, if I am really awake and aware, it's present at some level. These are 'old tapes' playing. Trying to shift this feeling, I have been using words like 'concerned', 'reluctant', 'hesitant', or perhaps 'uneasy'. Changing the word, definitely alters the feeling in my body. It is much less drastic. I feel calmer and am able to deal with situations in a more balanced manner. I am very capable, as some close friends will attest to, of being a real 'drama queen'. For too many years, my thoughts have focused on how much I dislike being alone, 'Flying Solo'. I've in fact used the 'hate' word. Strong language I have observed. Now, as I consciously shift, I am looking at being alone as an opportunity and a gift. An opportunity to know who I really am, to discover and nurture my authentic self. I've been viewing being alone as freedom to be and do anything I wish, at any time I wish, with whomever I wish. I have been given a chance to dig into my soul and find the lost bits, the bits which lay dormant for many years as I pleased, and took care of everyone but myself. I truly know, this time alone, is a gift. Now that I recognize it as such, I can act accordingly. Spending three months in San Miguel is a leap forward for me. It took a few years of baby steps to get here, however, I have arrived. The word 'fear' has been replaced by 'excitement'. I like it better. It certainly makes me feel better! I am much happier being excited than scared! 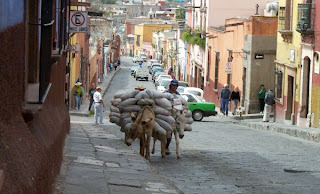 I'm looking forward to seeing and being in San Miguel, steeped in its colonial history. I'm looking forward to immersing myself in the warmth of the Mexican people. I'm looking forward to taking art classes, eating ethnic food, studying a little Spanish and enjoying all SMA has to offer. It is, after all, an artist colony. It is, after all an old Mexican town which has simmered for eons in a gigantic pot of tradition. Religious festivals, local cultural customs, fireworks and church bells and parades. I can't wait to see burrows on the streets again, to feel cobble stones under my feet and to touch the beautiful weathered walls of old colonial houses. Having said all that, I do have safety valves in place. My expectations are not set out of reach as they constantly were in days of old. I cut myself slack now. No longer do I have to be 'perfect'. My expectations and perfectionism were so high at one time, they literally stopped me in my tracks. I went to bed and stayed their off and on for years. There are times I feel like Rumplestiltskin, I've missed so much of my life. Should I experience a few days of feeling a little uncomfortable emotionally, I know I am able to get myself back in balance. Then again, if the whole trip went 'sideways' - however that may look at the time - I have given myself full permission to come home. I made sure my plane ticket allows for that possibility. So here I am. Excited and perhaps a little 'hesitant'. Moving forward none the less. Thank you for sharing your fears Salma. You offered me an opportunity to have a good look at how I feel about Flying Solo to San Miguel. I do hope you had a much better sleep last night. Do the thing you fear to do and keep on doing it... that is the quickest and surest way ever yet discovered to conquer fear. ~ Dale Carnegie. 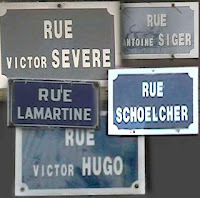 STREET SIGNS. Oh, I know you probably think it strange. Can't help it! I find them rather fascinating. Most of them have meaning. Most of the meanings are unknown to us. A few, however, catch our eyes, and ring bells. "Abbey Road" ... memories of the Fab Four! My days in London. Nights when we would see their white rolls in old London Town. 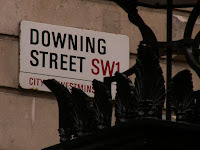 "Downing Street" ... No. 10 of course. My days in London when Health and Wilson teeter tottered back and forth in the seat of power. 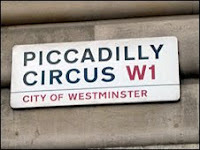 "Piccadilly Circus" ... Lights, busy, traffic, round and round. Fun, good company, great pubs, raising a little hell in one of the most exciting cities in the world. I especially like the London street signs. Perhaps I got a little attached when I lived there. Paris signs are fun though. Something very attractive about those too. If I had lots of space, a collection of street signs would be of great interest and amusement to me. Street signs make my heart sing.